This weekend started off nicely with date night. I love that our gym does this. Currently it's twice a month - once for members only and once open to anyone. I can pay less than half of what a babysitter would cost, drop my kids off for 4 hours at the gym to have pizza, play, have popcorn and watch a movie. Abby and Micah love it - but do tend to get tired towards the end when it's way past their normal bedtime. The rumor is that next month, they might try opening it up to the little ones too (right now it's potty trained and up.) That opens up quite a few more options since we usually end up just doing date night at home where we can put Alexis down to bed. Saturday was a fully packed day! We started off with a delicious breakfast of waffles, cooked by Beau. Then we headed to the gym. I knew I needed to burn off some calories! Plus I've gotten to be quite the gym addict lately - even hitting the treadmill and not just sticking to my favorite group ex classes. We raced home, I put my swim team skills into effect by quickly showering and changing. Thanks Coach P for giving me the skills to shower, dress, and get ready in under 10 minutes. I knew we were cutting it close with heading to my favorite group ex class but I decided the mad dash to get ready was worth it. Plus it meant relatively guilt free cake. Alexis tried her first watermelon at the birthday party. She loved it! Since the weather was beautiful out I just took her LSU shirt off so we didn't get it soaked with watermelon. It's normal to strip your baby to feed them right? 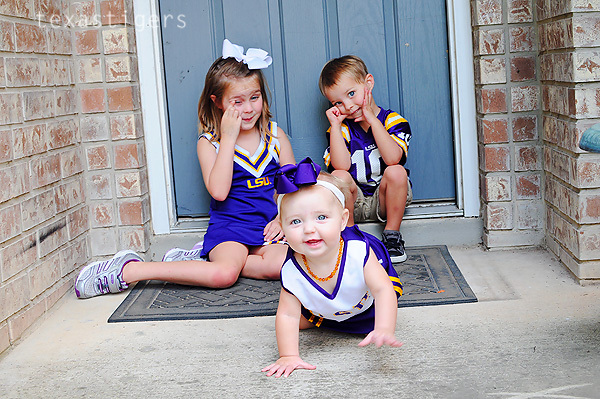 There was no doubt it was game day for LSU with all of us in our new game day outfits. Thanks Gigi! 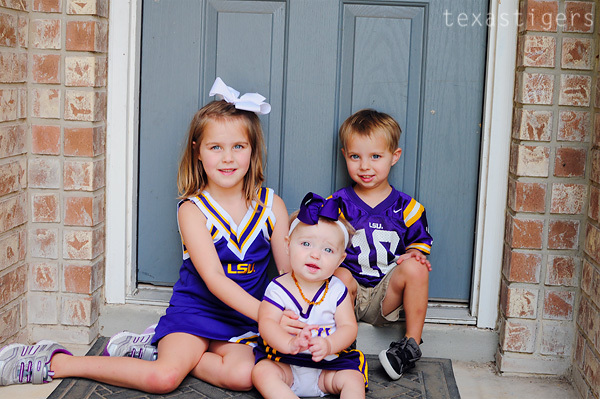 I think others might have thought we were crazy with all the purple and gold but hey if you were in Baton Rouge... or Louisiana for that matter it's what you were on game day and just because we are here doesn't mean we aren't going to wear our team colors. After the party, everyone was already worn out and quite the cranky bunch so even though Micah and Abby don't nap - I made everyone have a quiet time laying in the beds and guess what... everyone took a nap. 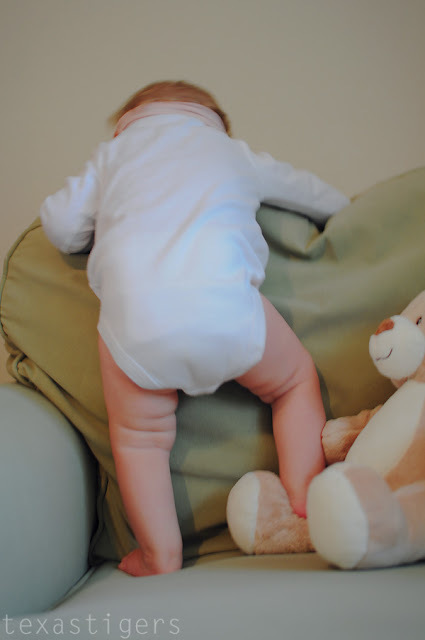 After naps, it was off to Bible class. When I told the kids, what we were doing for the day (gym, birthday party and Bible class) it was Bible class that they jumped up and down about! When we got home it was dinner time and of course game time! I tried to get a group shot but they were all pretty much done for the day. 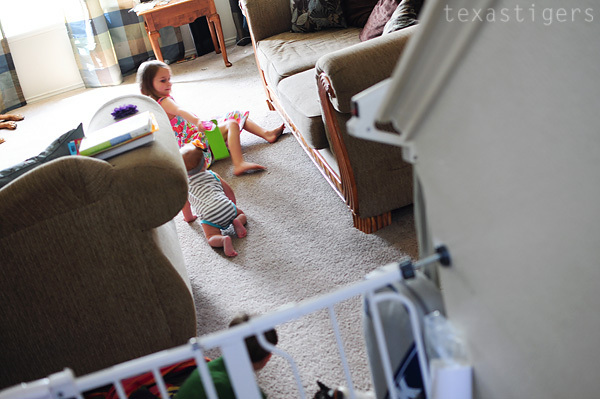 They were wound up from being tired and having taken naps so crazy and cranky at the same time. Sunday morning, we got up and head off to early service to meet Beau after his work shift. However Alexis had other ideas. Or rather her diaper failed to do it's job because it was pretty empty in comparison. So instead I look one look at Alexis, buckled Abby back in and we headed back home to clean up and wash both the baby and the carseat cover. With the carseat out of commission, we couldn't make it back for the second (or third) service either. 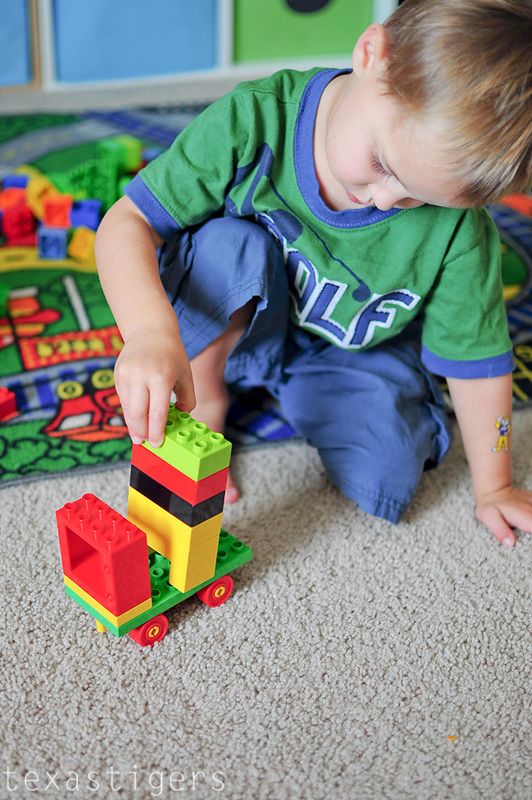 So we spent the day playing and cleaning up around the house. Even having made a mess in her carseat she looks adorable! Did you know that 1 in 5 kids in the US struggle with hungry? September is Hunger Awareness Month and I've joined with some local moms and bloggers to raise awareness for No Kid Hungry. 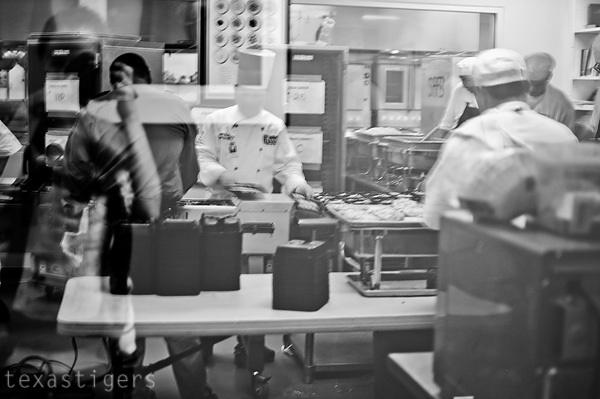 Last week I had the pleasure of meeting up with them to tour the food bank. 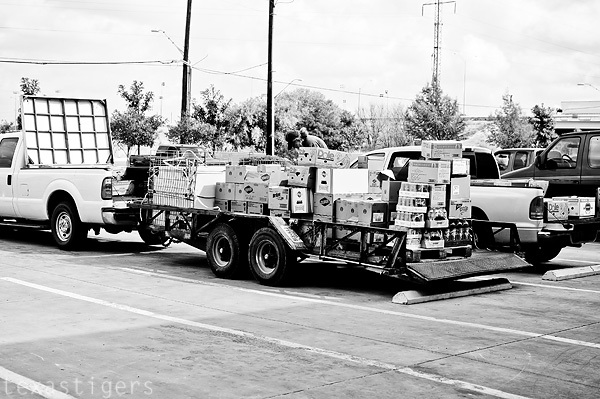 The San Antonio food bank feeds over 58,000 people each week. As full as these shelves look without donations, they would be empty in 2 weeks! Food drives are great and they'll help to fill these shelves and lots of hungry people but don't overlook a simple donation of $1. I know our grocery store has the option of adding $1, $3, or $5 to your grocery bill. With a single dollar, the food bank can turn it into $13 worth of food. The food bank even accepts donations of pet food so that families and seniors don't have be separated from their loved furry family members and cause more heart ache in a rough situation. The San Antonio food bank works as a large storage pantry for the over 515 non-profit agencies to get food to those who need it. These agencies place an order for what they need and come and pick it up. When they come to pick up their orders they can also shop in the "store" for things they might also need. The store has things that might be perishable, like produce, that they need to move off the shelves quickly. In addition to distributing food through these agencies, the food bank has several mobile food pantries that run Monday - Friday distributing food directly to those in need. Kids cafe meals are packed each day by trustees from the jail. Kids can go to a safe place after-school, get help with homework and have a hot dinner. The food bank also has a backpack program for kids that weren't eating over the weekend and coming to school sick and hungry. A food pack of food easily opened and prepared by kids is sent home in their backpack every Friday. In addition to feeding the children, the trustees learn a valuable job skill and those that graduate from here move on to another site where they learn how to feed a larger number of people. Some donations coming from large stores come without labels. One of the jobs for volunteers is to put labels on these cans. Other volunteer opportunities include sorting and packing boxes, helping at one of the mobile pantries. Even your younger children (ages 8 and up) can help in the community garden with weeding, planting, watering. 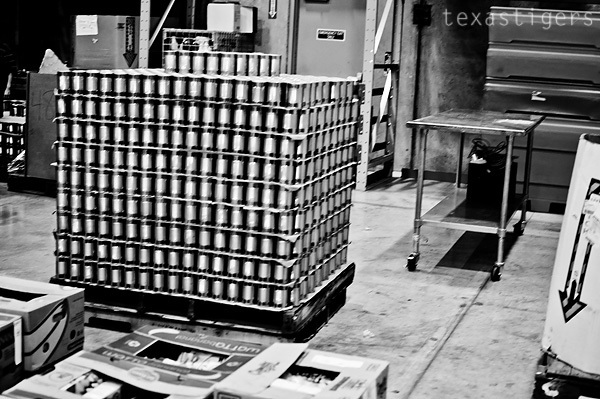 Many might think of the food bank in terms of canned foods that can stay on the shelves. It's much more than that. The food bank strives to provides lots of fresh produce. We saw lots of watermelons when we were touring. 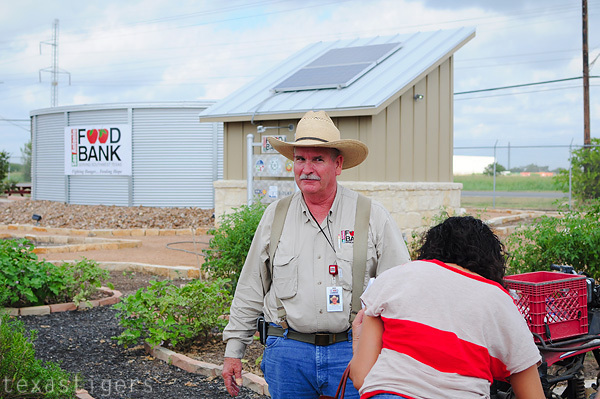 The San Antonio food bank also has a community garden to grow lots of fresh produce. Right now the garden is much smaller - this area will be the teaching garden (they even have a gardening class you can attend with the head gardener!) Once the addition, that will double the size of the food bank, is complete there will be a huge garden again. This garden is also complete with a bee hive for teaching and pollination and water storage tanks. So how can you help? 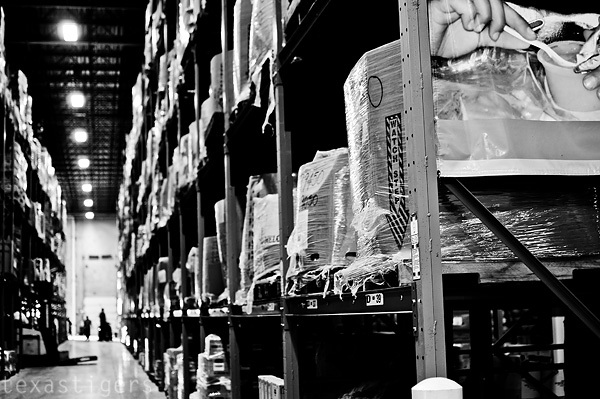 Volunteer at your local food bank, donate your time, donate food, or donate money. From now until September 22, you can even find a local restaurant participating in Dine Out for No Kid Hungry - each restaurant has their own promotion, most where if you donate to No Kid Hungry, you'll get a percent off/free item with purchase/couple for a future purchase. Sunday morning, thanks to our new school routine, everyone was up bright and early. So early service it was. This means we were back home by 9:45 am with a day of nothing planned. It was a good day of nothing though. Lots of free, imaginative play went on. Lexie took off and crawled into Abby's room while I was folding laundry in our bedroom. Abby came and gathered up some toys for her and then I came in a found this. A choo-choo just for Miss Alexis. What can I say besides it kept them all entertained and giggling. While fixing lunch, Alexis was interrupting the "wolf pack" game Abby and Micah had going. So Abby pulled out her favorite "trick" and showed Alexis something she might be interested in and convinced her to follow it. 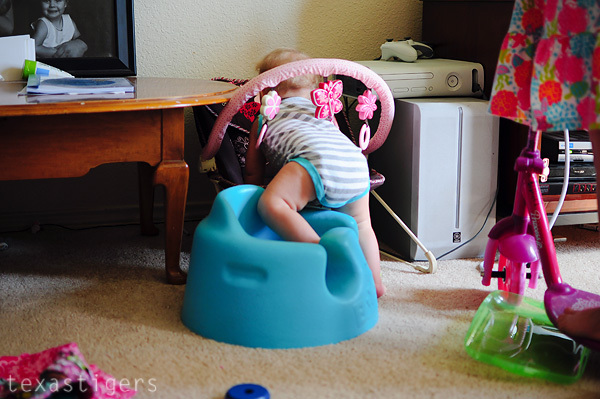 Both kids do this trick now if Alexis is crawling into something they don't want her to mess with. Micah then wanted a picture of him taken so of course I had to do it. Oh and Alexis had a moment of 'stardom' over the weekend. At the beginning of the summer I had the pleasure of attending a photography workshop with the White On Rice Couple and they used a photo they took of Alexis on their blog over the weekend. Hope ya'll had a good holiday weekend! 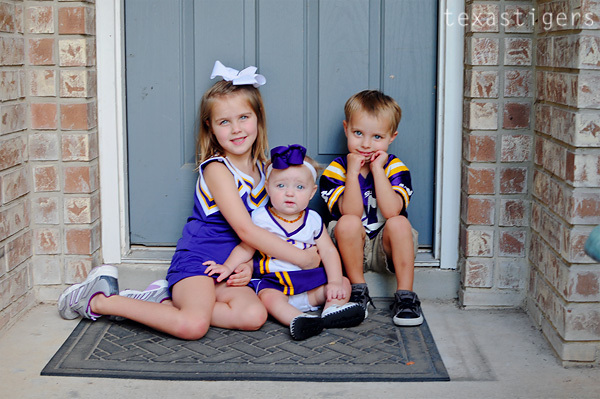 Time to break out the purple and gold! It's game day - college football season is here! While we aren't actually going to the game (ya know since it's 9 hours away... without stopping) we can still get decked out in our purple and gold. Well at least most of us can. Abby only wore it for the picture. 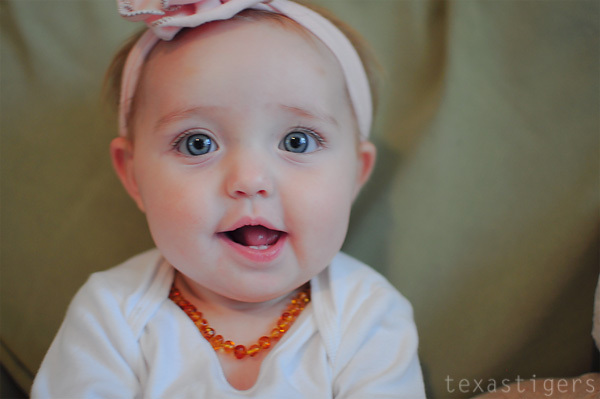 She's opinionated on what she likes to wear but at least she was cooperated for a picture session. It's been a while since I took a picture of all three (as it's not an easy task!) 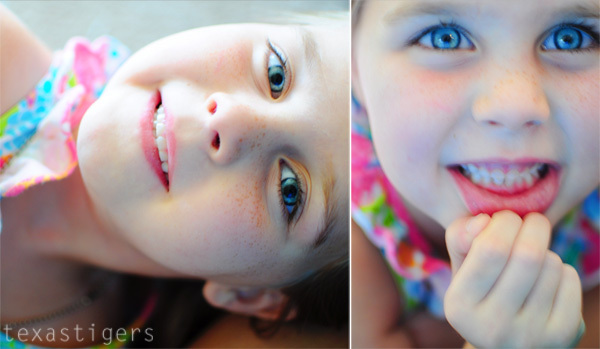 We managed to get a couple decent shots! We don't have any big plans for the game tonight. We'll be at Bible class and hopefully get home in time for the 2nd quarter. Leftovers for dinner then bedtime for the littles during half time. Then it's popcorn and the second half for mommy! Well unless Alexis has other plans like she did last night, where she was cranky, didn't want to play, but also didn't want to sleep. 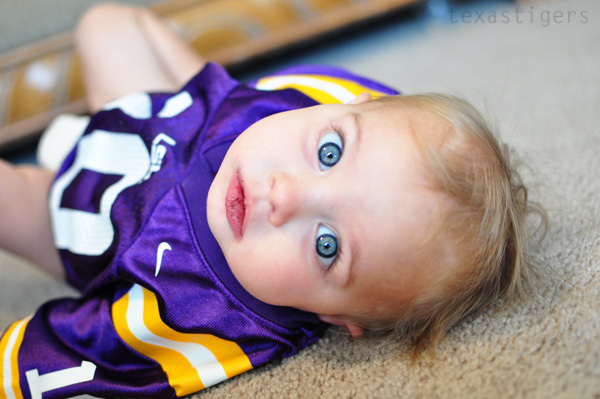 Micah has gotten quite a lot of wear out of his LSU jersey. This is year 3 he'll be wearing it and it still fits - actually finally fits is more like it (it's a 2T) This is last year. Abby looks so much older this year than last year! 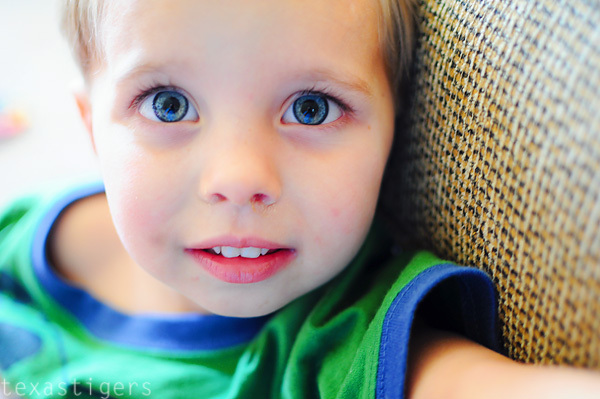 And this is 2010 - Micah was 18 months here. I can clearly see a resemblance between him and Alexis from this picture! It was more like a jersey dress here but we wore it anyway. 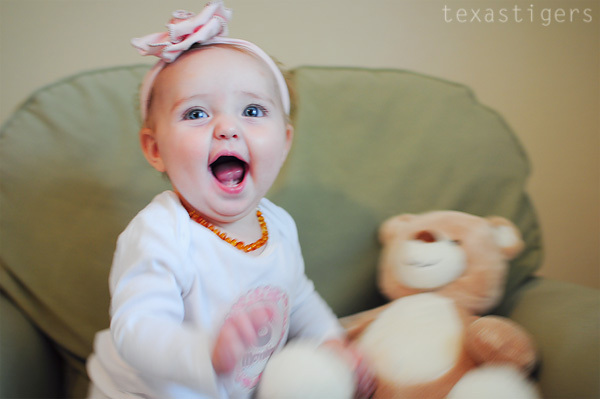 And here's Abby at about 13 months in the same cheerleader outfit Alexis is wearing today. I think they are clearly siblings! Right? And when trying to take a picture with a group of multiple small children... there isn't a way to avoid outtakes so here's my favorite. 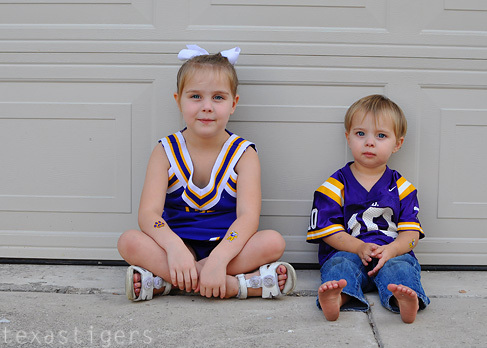 Hope you are having a good game day and GEAUX TIGERS! It's been a long, busy week adjusting to the routine (early mornings!) of school. Our bedtime routine was already in place for school nights but we still had to get up 45 minutes to an hour early than we had been. Abby actually did well and got up and was in a good mood and happy to go to school all but one morning. Thursday morning she had a rough time because Micah was staying in his pjs and wasn't going to school so I got my first "I don't want to go to school!" of the year that morning. Abby wanted to me to walk her to her classroom door so I gladly agreed. The school is just around the corner so we walked from our house most days (every day except Friday when we were running a little behind - walking would have gotten us there in time but it would have been a fast pace and my legs were dying from pump and cycling!) On Tuesday, Beau hadn't gotten home yet with the car that had the double stroller and two of the carriers I use more often (usually one of those is in the house) - good thing I love babywearing and my carriers because I still had several options inside. Having Micah come along to drop Abby off was not the smartest idea on day 2 of school though. Day 1 he did great, went off and played and barely even asked about Abby. I think he was happy to have the toys to himself! However 2 day he was very sad and not happy about leaving Abby at school since he came with to drop her off. Watching the trash truck come down the street did help a little in cheering him up. I don't know that I could have planned more for Tuesday afternoon if I had tried! We started with a trial gymnastics class. Abby had a blast and as I had promised for her birthday we are now signed up for lessons. She was very giggly while they were showing her the uneven bars. I think she liked it a little bit. Ha! From gymnastics, I came home, dropped Abby off to eat dinner, and I changed and Alexis and I headed off to parent orientation for first grade. Then after that was over we met my mentoring moms group out to eat for dinner. Alexis charmed everyone there. She was a happy smiley girl for most of dinner. Abby is picky about her hair and doesn't really like me to put it up out of her face for school (we usually compromise on a little pony tail on the top) but she loves having a braid. However braiding her fine silky hair is no easy task! Abby seems happy about school, although she's not too big into giving lots of information about what she did all day. She does give me some though - more than she did last year. I get a good impression of her teacher so I'm thinking she'll have a good year. If this was ya'lls first week of school how'd it go?